On Sunday (4th August), I had the pleasure of being invited on to Jamie Owen’s programme on BBC Radio Wales to discuss the imminent announcement concerning who would be cast as the twelfth incarnation of the titular Time Lord in BBC One’s flagship family drama series Doctor Who (2005- ). Ever since Matt Smith announced in early July that he would be leaving the role later this year, speculation has been rife in both the press and amongst the programme’s fans as to who would take over as the Twelfth Doctor. If the immediate reaction of some fans was to be believed, as one highly astute (and humorous) poster on Twitter summarised, the consensus leaned heavily towards the next Doctor being ‘a non-white lesbian who looked remarkably like David Tennant’. My appearance on Jamie Owen’s show obviously contributed towards the wealth of publicity generated in the run up to the announcement on Sunday night’s (highly showbiz) Doctor Who Live: The Next Doctor (2013) that Peter Capaldi would take over control of the famous Type 40 TARDIS. Pre-announcement speculation can now, however, turn to critical reflection as Capaldi’s casting raises some interesting questions concerning the programme itself, television as a medium and the culture which surrounds Doctor Who and British television more generally. Firstly, with regard to the series itself, Capaldi’s casting suggests that some potential adjustments to Doctor Who’s employment of genre codes may arise. At 55, the same age that First Doctor William Hartnell was when he took on the role, Capaldi is notably older than both Matt Smith (26) and David Tennant (34) were when they were cast in the role. How will this increase in the age gap between the actors playing the Time Lord and the companion affect the present onscreen relationship and narrative dynamic between the Doctor and the irksome Clara (Jenna-Louise Coleman)? Much of the narrative of this year’s ‘Series 7.2’ has centred around the Doctor’s doe-eyed pursuit of, and enthrallment with, Clara’s status as ‘The Impossible Girl’ who died saving the Doctor’s life in preceding episodes ‘Asylum of the Daleks’ (2012) and ‘The Snowmen’ (2012). Now that Clara’s enigmatic nature has been revealed (she jumps into the Time Vortex in ‘The Name of the Doctor’ (2013) to pursue The Great Intelligence (Richard E. Grant) and so becomes reiterated throughout time and space to continually save the Doctor’s life), the character seems at a bit of a dead-end as to why audiences should be interested in her. What’s more, Matt Hills has rightly identified in his book Triumph of a Time Lord that a key part of Doctor Who’s success since it returned in 2005 has been its employment of ‘soap drama’ conventions (e.g. focusing on ongoing emotional relationships via serialised narratives) to construct relations between the Doctor and the companion. Given the gap between Capaldi and Coleman, will audiences buy into and accept this aged performer swooning over someone young enough to be his real-life daughter? Will the Doctor-companion relationship instead be reconstructed to be more in line with the programme’s early years where a more (grand)father-daughter dynamic was used? Or perhaps, given that part of executive-producer Steven Moffat’s authorial signature concerns playing with constructions of narrative time, are we going to be presented with storylines where numerous Claras interweave to assist the Doctor throughout different episodes? Although much of this is speculation, Capaldi’s age does indicate that an adjustment to certain aspects of Doctor Who’s established generic format may be required. Capaldi’s casting also raises potential issues for the BBC given that his televisual persona is already partly established through his role as the poetic-yet-vulgarly-insulting spin doctor Malcolm Tucker in political satire The Thick of It (2005-12). As I teach undergraduate students on my second year ‘Tele-Fictions’ module, television’s characters are essential to how audiences engage with the medium as viewers regularly speculate about narrative developments in terms of ‘what will happen’ to favoured characters. Additional research into the characteristics of television as a distinct media form has also noted that TV is partly defined by its repetitive nature. As a result, actors become familiar through their weekly re-appearances as characters in new/repeated episodes of a programme (as well as annually for new series). This process ultimately means that actors quickly become bound to, and recognised through, the roles they play (or have played) in popular series (just think about Jennifer Aniston and her role as Rachel Green in Friends (1994-2004)). Capaldi’s appearances as Tucker across four series of The Thick of It (as well as the movie In the Loop (2009)) is indicative of these processes in action as, for many viewers, he is immediately recognised through knowledge of this role. It is therefore highly noticeable that, although Capaldi’s familiarity as Tucker may work to bring new generational audiences to Doctor Who (and has already generated humorous mash-up videos on YouTube), strategies have already been mobilised by Doctor Who’s promotional team to distance Capaldi from the character of Malcolm Tucker. Not only was this avenue of discussion immediately closed off during his introduction on Doctor Who Live, but multiple press articles have been quickly generated which construct Capaldi-as-Doctor Who fan rather than Capaldi-as-Tucker. Yet, as the dust starts to settle around Capaldi’s introduction, arguably the most difficult question concerning casting the Doctor remains. Despite a lot of support being generated for a non-white or female Doctor, the BBC has nevertheless cast another white middle-class male in the role. Perhaps Doctor Who’s most problematic question to address, then, is why not go there and change the gender or race of its titular character? The gender question can potentially be answered by turning to existing knowledge concerning dominant industrial processes concerning branding and combining this with studies of child television audiences. 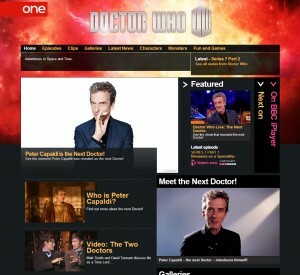 Hills’s analysis of Doctor Who’s 2010 rebranding recognises that such practices ultimately necessitate ‘superficial change and substantial sameness’ in that, although alterations to the programme brand image can take place, major changes to the established format can’t occur as this could reduce the programme’s established brand equity. Recasting the Doctor as a woman would be indicative of such a radical overhaul and risks alienating young male viewers as it is understood by both industry personnel and academics that whilst young girls will watch programmes intended for boys that feature male heroes the reverse is not the case. If the Twelfth Doctor would have been female, it’s pretty predictable that we would have seen a male companion character within the TARDIS very soon after! Nevertheless, the question concerning the Doctor’s status as a white male remains. The only answer we currently have to this question is Moffat’s statement that it was simply ‘the right time’ to cast Capaldi in the role. However, as a scholar of television, it is necessary to adopt a critical attitude to such press statements. As Media Studies academic John Thornton Caldwell suggests, we need to view such insights into the decision-making process as a ‘performance of production’ where a particular image of the television industry becomes constructed and played out. Thus, whilst Moffat’s statement conveys to viewers that the role is open to anyone irrespective of age, race or gender, an elephant arguably remains in the TARDIS.